Dunedin Hopsital is in code black – it’s highest alert – as it tries to contain its second major outbreak of norovirus in recent months. The last outbreak, in August, led to a ban on visitors and a cancellation of clinics and non-urgent admissions. Last week the Oamaru Mail reported a high incidence of stomach bugs in North Otago but the cause wasn’t identified. Bernard Hickey says parliament should be recalled so all parties can be fully informed about and debate the economic and financial crisis. It doesn’t need comment from me, if you’re interested I suggest you read it all here. This question was put to me when I was looking after our profoundly disabled son and wrestling with the decision on whether to allow someone else to care for him while I had a break. Once I’d made the decision and thanks to IHC’s shared care scheme he started spending three days a week with another family, I realised it was best for him and the rest of our family. We got a rest and were able to do some of the ordinary things which were difficult when he was with us like going for a walk or to the river; he still got well cared for and other people got to know him and his needs which provided security for him should anything happen which meant I couldn’t look after him. It is demanding and difficult looking after someone who is ill or disabled but at least I had youth on my side. Often those who look after elderly relatives are older themselves and the strain of caring for their family member puts their own health at risk. National has recognised this and I’m delighted that health spokesman Tony Ryall has announced the party will put more money into respite care to enable those caring for elderly relatives to have a break. Respite care will also be available for people living alone who need temporary care because of illness. Some people have a gift for giving – coming up with original ideas which thrill the recipient. Alas, I’m not one of those and while I don’t find it easy to come up with the perfect present for the females in my life, it’s even more difficult to find the right thing for the males. However, a few years ago I was making cakes for a raffle shortly before my older brother’s birthday which reminded me he loves fruit cakes so I made an extra couple for him. They were greeted enthusiastically and that’s what I’ve fallen back on ever since. 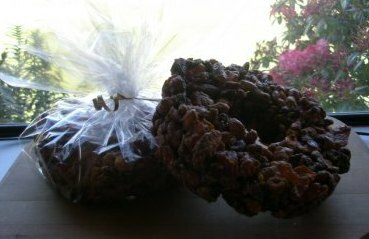 I use Alison Holst’s recipe for Cathedral Window Cake, which is mostly dried fruit and nuts held together with a little batter. The recipe specifies the fruit and nuts but it doesn’t really matter what you use – I usually replace the cherries with cranberries, some of the other nuts with hazlenuts and sometimes add ginger. The recipe says use one 20cm ring tin but I find the mixture fits in to two tins that size. When I put them in the oven I put a sheet of lunch paper on top and then newspaper for the first hour or so to allow the inside to cook without the fruit and nuts on top getting overbrowned. The Green party has announced it would prefrer to work with Labour. I hope the delay in announcing that has been an eleaborate ploy to gain attention rather than an indication they were seriously considering anything else. Because if they really needed the weeks it’s taken them to make the announcement to work out their preferred coalition partner they’re too stupid to be in parliament let alone government. Of course they’d prefer Labour because the Greens are a party of the left and that’s their greatest weakness. If they were strong on the environment and moderate on social and economic issues they’d be the only centre party which stood for anything and hold the balance of power election after election. But their radical social and economic agenda puts them on the extreme left which means Labour’s can take them for granted so their destiny is in Labour’s hands not their own. John Key has announced that National will increase front line police numbers. Only 210 (or 21%) of the 1,000 new sworn police recruited under the Labour-NZ First agreement have been posted to general frontline duties, and National wants to change that and deploy more to the front line. “We will boost overall New Zealand police numbers so there is one officer for every 500 people, and we will keep this ratio as the population grows. This means training 600 extra police officers from January next year through to the end of 2011. “National will ensure the tail-end of the current Government’s extra 1,000 police are frontline personnel, and we will top up the numbers with additional recruits each year. We estimate that will mean a total of 600 extra officers before the end of 2011, of which 220 will be in addition to previous commitments. “People in South Auckland deserve a police force that is better able to respond to crime and whose visible presence deters crime. The causes of crime are complex, but more police on the streets is important for crime prevention and for speedy action when a crime’s committed. I got a message from an irate National Party member this morning about Labour Party advertising that screened on TV3 at the weekend. I didn’t see the ads but gather they start looking as if they might be for National then put the knife in and are apparently following the example of ads used in the USA. I told my caller that as long as they weren’t lying there’s was nothing we could do and reminded him dirt sticks to the hand that throws it. In August the fair-weather Finance Minister was asked about National’s sensible plan to slightly raise borrowing to build much-needed infrastructure and stimulate growth. He described it as borrowing for tax cuts. Can we trust them to do that? You are currently browsing the Homepaddock blog archives for the day Monday, October 20th, 2008.